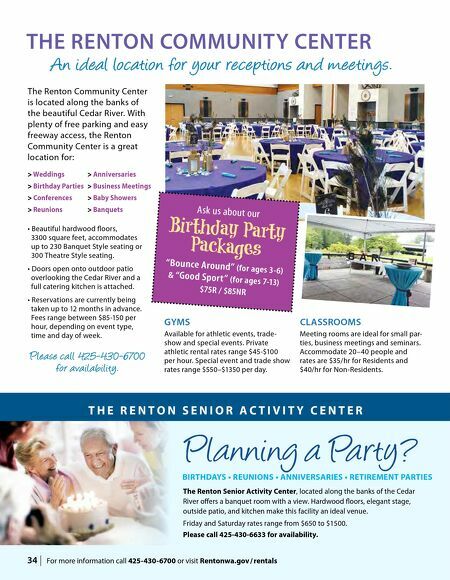 34 | For more information call 425-430-6700 or visit Rentonwa.gov / rentals T H E R E N T O N S E N I O R A C T I V I T Y C E N T E R The Renton Senior Activity Center, located along the banks of the Cedar River offers a banquet room with a view. Hardwood floors, elegant stage, outside patio, and kitchen make this facility an ideal venue. Friday and Saturday rates range from $650 to $1500. Please call 425-430-6633 for availability. BIRTHDAYS • REUNIONS • ANNIVERSARIES • RETIREMENT PARTIES Planning a Party? > Weddings > Anniversaries > Birthday Parties > Business Meetings > Conferences > Baby Showers > Reunions > Banquets • Beautiful hardwood floors, 3300 square feet, accommodates up to 230 Banquet Style seating or 300 Theatre Style seating. • Doors open onto outdoor patio overlooking the Cedar River and a full catering kitchen is attached. • Reservations are currently being taken up to 12 months in advance. Fees range between $85-150 per hour, depending on event type, time and day of week. THE RENTON COMMUNITY CENTER The Renton Community Center is located along the banks of the beautiful Cedar River. 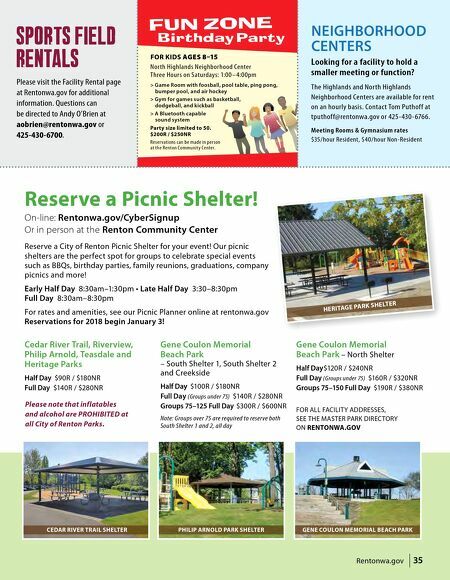 With plenty of free parking and easy freeway access, the Renton Community Center is a great location for: GYMS Available for athletic events, trade- show and special events. Private athletic rental rates range $45-$100 per hour. Special event and trade show rates range $550–$1350 per day. CLASSROOMS Meeting rooms are ideal for small par- ties, business meetings and seminars. Accommodate 20–40 people and rates are $35/hr for Residents and $40/hr for Non-Residents. Ask us about our Birthday Party Packages "Bounce Around" (for ages 3-6) & "Good Sport" (for ages 7-13) $75R / $85NR An ideal location for your receptions and meetings. Please call 425-430-6700 for availability.